Almeida, M. P., Barthem, R. B., Viana, A. S. & Charvet-Almeida, P. Factors affecting the distribution and abundance of freshwater stingrays (Chondrichthyes: Potamotrygonidae) at Maraj� Island, mouth of the Amazon River. Pan-American Journal of Aquatic Sciences, 4(1): 1-11. Download PDF file (463 Kb). Sahoo, P. K., Saikia, S. K. & Das, D. N. Natural food resources and niche breadth of Barilius bendelisis (Hamilton) (Pisces, Cyprinidae) in river Dikrong, an upland riverine ecosystem in India. 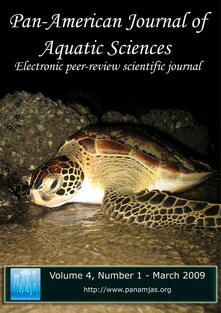 Pan-American Journal of Aquatic Sciences, 4(1): 12-16. Download PDF file (54 Kb). N�brega, M. F., Kinas, P. G., Lessa, R. P. & Ferrandis, E. Distribui��o espacial e temporal da guai�ba Ocyurus chrysurus (Bloch, 1791) (Teleostei, Lutjanidae) capturada pela frota pesqueira artesanal na regi�o nordeste do Brasil. Pan-American Journal of Aquatic Sciences, 4(1): 17-34. Download PDF file (704 Kb). Zica, E. O. P., Santos, K. R., Ramos, I. P., Zanatta, A. S., Carvalho, E. D. & Silva, R. J. First case of an infection of the metacercariae of Austrodiplostomum compactum (Lutz, 1928) (Digenea, Diplostomidae) in Hypostomus regani (Ihering, 1905) (Siluriformes: Loricariidae). Pan-American Journal of Aquatic Sciences, 4(1): 35-38. Download PDF file (150 Kb). Jorgensen, P., Bemvenuti, C. E. & Hereu, C. M. Feeding of Farfantepenaeus paulensis (P�rez-Farfante, 1967) (Crustacea: Penaeidae) inside and outside experimental pen-culture in southern Brazil. Pan-American Journal of Aquatic Sciences, 4(1): 39-51. Download PDF file (327 Kb). Ansari, A. A. & Khan, F. A. Remediation of eutrophied water using Spirodela polyrrhiza L. Shleid in controlled environment. Pan-American Journal of Aquatic Sciences, 4(1): 52-54. Download PDF file (34 Kb). Maia, S. C. A., Molina, W. F. & Maia-Lima, F. A. Analysis of fluctuating asymmetries in marine shrimp Litopenaeus schmitti (Decapoda, Penaeidae). Pan-American Journal of Aquatic Sciences, 4(1): 55-62. Download PDF file (61 Kb). Contente, R. F., Stefanoni, M. F. & Spach, H. L. Size-related changes in diet of the slipper sole Trinectes paulistanus (Actinopterygii, Achiridae) juveniles in a subtropical Brazilian estuary. Pan-American Journal of Aquatic Sciences, 4(1): 63-69. Download PDF file (235 Kb). Mnasri, N., Bouma�za, M. & Capap�, C. Morphological data, biological observations and occurrence of a rare skate, Leucoraja circularis (Chondrichthyes: Rajidae), off the northern coast of Tunisia (central Mediterranean). Pan-American Journal of Aquatic Sciences, 4(1): 70-78. Download PDF file (345 Kb). Barroso, C. X. & Matthews-Casc�n, H. Distribui��o espacial e temporal da malacofauna no estu�rio do rio Cear�, Cear�, Brasil. Pan-American Journal of Aquatic Sciences, 4(1): 79-86. Download PDF file (422 Kb). Teixeira, G. M., Fransozo, V., Cobo, V. J. & Hiyodo, C. M. Population features of the spider crab Acanthonyx scutiformis (Dana 1851) (Crustacea, Majoidea, Epialtidae) associated with rocky-shore algae from southeastern Brazil. Pan-American Journal of Aquatic Sciences, 4(1): 87-95. Download PDF file (304 Kb). Oda, F. H., Felismino, M. F., Lopes, L. P. C. & Oda, T. M. . Pan-American Journal of Aquatic Sciences, 4(1): I. Download PDF file (169 Kb).